A group of mercenaries come together to form the ultimate band of heroes, just as a group of old action heroes (a.k.a The A(ging)-Team) come together to create the ultimate action film. This may be the most "awesome action cast ever assembled" but it takes far more to create the most 'awesome action film' period. Sly Stallone directs and stars, looking increasingly like David Guest in his old age as he pants along for much of the film. It's shot largely by fast-paced handheld camera in the dark, seemingly to hide the wrinkles. Clearly he didn't bank on some people watching in HD (mwahaha). This also has the effect of making much of the action unintelligable, falling victim to typical action film syndrome. And typical this is. The story narrates the....wait...there was a story? It's just a load of blokes blowing sh*t up. Any attempts at characterisation fall not only flat, but are blasted into the grenade-induced dirt-filled craters. Guns, knives, vehicle chases and big, tattooed muscle-men smoking cigars all feature heavily. The script is so laughably predictable it's quotable before the lines are even spoken. And let's not forget the one short scene that features Arnold Schwarzenegger and Bruce Willis, despite apparently taking six hours to shoot - so appallingly cliched that they aren't even credited. Even Jean-Claude Van Damme turned down a role because he felt the character had no substance. That's saying something. But watching Sly racing to jump on a moving plane, chest wabbling, heart visibly pounding, his stumpy legs almost failing to keep up is comedy genius and proves the film doesn't take itself too seriously. 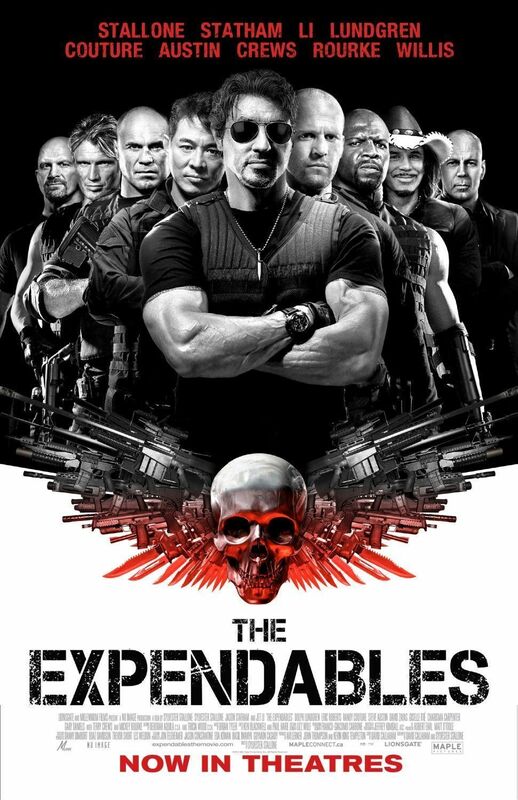 The Expendables is so bad it's....almost....good?